The Akhand Kirtani Jatha is an inseparable and invaluable part of the Khalsa Panth. The Jatha’s purpose is to provide Sikhs around the world with Sangat (companionship with enlightened souls), just like any other Jatha or group within the greater Khalsa Panth. The Jatha organizes Kirtan Smagams in dozens of cities around the world, spreading the transformative power of lovingly sung Gurbani to all. The Jatha also has a strong focus on the Sikh lifestyle or Sikh Rehit. The Sikh lifestyle was embodied in Bhai Randhir Singh, a revolutionary freedom fighter who also rose to the highest of spiritual heights. Bhai Randhir Singh (lovingly referred to as Bhai Sahib), was a revolutionary, an author, a poet and a saint. The Jatha (group) was started in the late 1800s, when Mata Gulab Kaur, a spiritually enlightened Gursikh woman asked Bhai Randhir Singh to re-invigorate the Khalsa Panth with Kirtan. For a long time, the Jatha did not have an official name. In the past, it was often referred to as the “Waheguru Singhs”. In one such text, this was because people would say that everywhere these Gursikhs went, they would walk, talk, work, sleep, with Waheguru resounding around them. 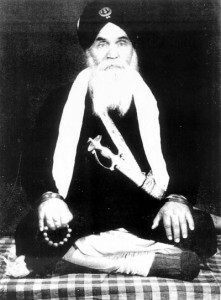 Other names for the Jatha have included the Nirban Kirtani Jatha and “Bhai Randhir Singh da Jatha”. The name AKJ only became common when Bhai Randhir Singh started doing Kirtan in all of the historical Gurdwaras. It was when Bhai Sahib started doing his marathon non-stop kirtan sessions that the name Akhand Kirtani Jatha (non-stop kirtan group) became prominent and was used often by the SGPC officials and the historical Gurdwaras where they performed Kirtan. This was how the name Akhand Kirtani Jatha came into existence. Bhai Sahib never named the Jatha and only referred to it as ‘the Jatha’, a name commonly used in India, which means a group. The name was started by Parbandaks and managers of the Gurdwaras; later it got registered in the 1970s, as was the case with most panthic groups. Today it is a worldwide organization which spreads the message of Shabad Guru, and considers itself a part of the Khalsa Panth and not a separate entity. Gursikhs from the Akhand Kirtani Jatha believe that Sikhi is an all-absorbing element of a Sikh’s life. From the Amrit Vela hours until one goes to sleep, Naam and Gurbani should be central throughout. Sadhsangat and in particular, kirtan done in sadhsangat is a central element of the lifestyle promoted by the Jatha. Most Gursikhs affiliated with the Akhand Kirtani Jatha strive to increase their nitnem above and beyond the minimum and many follow Gurmat teachings such as dietary bibek. You can learn more about the lifestyle of Gursikhs from the Akhand Kirtani Jatha by reading books such as The Autobiography of Bhai Sahib Randhir Singh or Rangle Sajjan.